Stirling Council has embarked on a ground-breaking project in partnership with Scottish Water Horizons that will be the first in the UK to use a mix of cutting-edge renewable technologies to harness energy from waste water. The Stirling Renewable Heat Project will bring cheap, low-carbon heat to the city through a district heating network, delivering a range of significant environmental and economic benefits. The Council and Scottish Water Horizons (SWH) have invested £1million and £3million in the project, respectively, with £2million coming from the Scottish Government’s Low Carbon Infrastructure Transition Programme (LCITP) – funded jointly by the Scottish Government and the European Regional Development Fund. This brings the total investment in the scheme to £6million. SWH will own and operate an energy centre, located at the existing Stirling Waste Water Treatment Works in Forthside, which will house the new technology. SWH will sell the heat to Stirling Council at an agreed rate and volume, which the Council will then sell on to users via the heating network. Initially, the heat will be distributed in the Forthside area to the Peak, Forthbank, St Modan’s High School, the Robertson Trust Barracks Development, Moray House, Jubilee House and potential future developments at Forthside. There is scope for the network to also be expanded across the city to include homes, helping tackle fuel poverty and providing savings for businesses. Local building services company FES have won both contracts for the project. Work is expected to be completed by April 2019. • no impact on air quality. For the first time in the UK, a Combined Heat and Power (CHP) unit will be used with a waste water and heat pump system to deliver heat for a district heat network. . The CHP will deliver renewable electricity to power the waste treatment site and combine with technology designed to recover heat from Scottish Water’s wastewater system, providing low carbon heat to the network in the form of hot water. Biogas, currently a waste product, will be stored for use in the heating network. This pioneering project comes on the back of Stirling Council becoming the first local authority in Scotland to sign a Sustainable Growth Agreement with SEPA, underlining its continuing commitment to environmental protection. Councillor Jim Thomson, Convener of Stirling Council’s Environment and Housing Committee, said: “Making Stirling the first in the UK to harness this mix of cutting edge renewable technologies in this innovative initiative is a clear statement of our commitment to tackling climate change by reducing our carbon emissions and improving energy efficiency. Paul Kerr, Head of Scottish Water Horizons, said: “With heat accounting for over half of the energy used in Scotland, Scottish Water Horizons is committed to contributing to Scotland’s low-carbon economy. 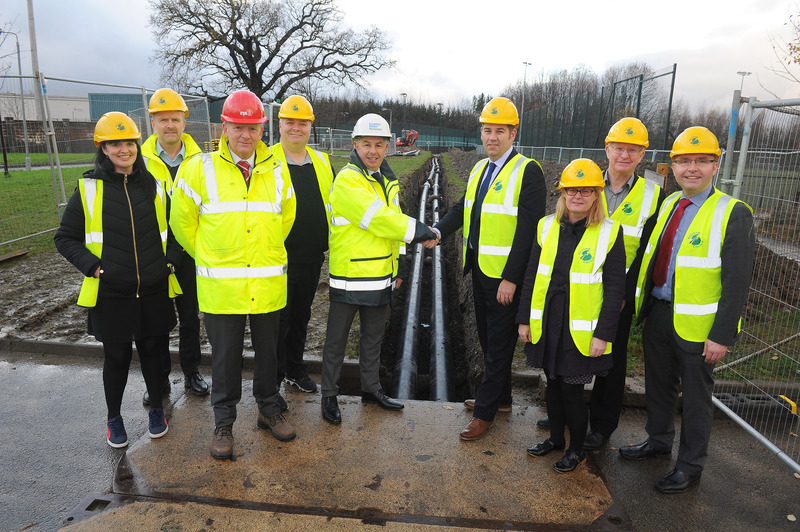 Picture shows Paul Kerr, Head of Scottish Water Horizons and Brian Roberts, Stirling Council’s Senior Manager for Infrastructure, shaking hands on the ground-breaking Stirling Renewable Heat Project, alongside officers from Stirling Council, Councillors and Charlie Easton, Director of FES.